TradesConnect.ie provides a contractor/client matching service in Ireland. Its blog is simple and has been designed for ease of maintenance with limited management time and effort to operate. Several recent posts, for example, have been contributed by guest contributors reflecting their relevant business interests. In my opinion, a blog doesn’t need to be fancy to do its job: Providing relevant information to readers geared for the site owner’s overall business objectives and goals. You won’t set the world on fire with a basic blog, but your time/energy contribution will be minimal — and you’ll still reap some of the blog’s advantages of search engine optimization and reader engagement. The blog’s recent topic that most interests me, because of its profound international consequences, is Brexit — clearly a vitally important issue in Ireland. Here are some excerpts from What Brexit means for the Irish construction industry. Britain will no doubt lose out on skilled foreign nationals moving to the UK due to the restrictions of freedom to work outside of the EU. This is particularly concerning for the UK as a recent study from the Office of National Statistics stated that 28% of all Tradesmen on work sites in London are from overseas. 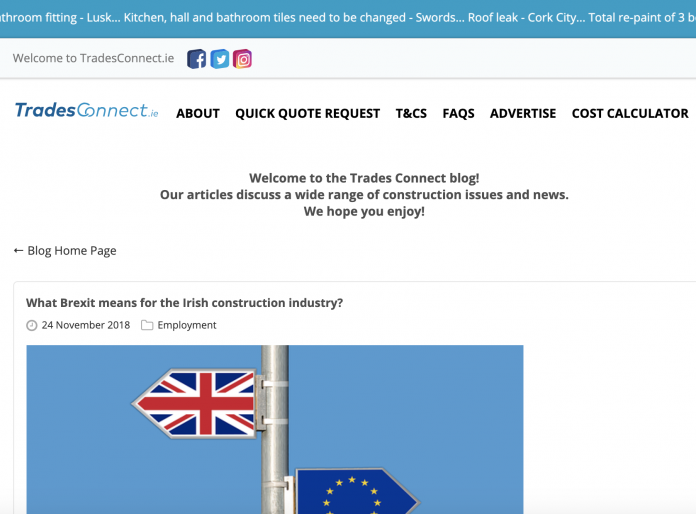 Ireland as result could gain from this potential loss, especially as the CIF has recently stated that Ireland faces a skill shortage of up to 100,000 tradesmen in the coming years. Furthermore, if Brexit has a negative impact on the British economy, a collapse in the British Pound could also result in Tradesmen leaving the UK as people seek better pay and higher standards. The housing sector could go either way. The restrictions on trade that may come with Brexit could greatly effect the pricing of housing supplies. As taxes increase, the price of building will increase. Thus, decreasing the supply in housing. Alternatively, as skilled labour in the construction industry (and the IT industry) increases, so could the demand for housing. This is most likely going to have a stronger impact in Dublin more than anywhere else and could possibly lead to a further divide in the housing prices between Dublin and the rest of Ireland. There are reasons to believe that Brexit could have a positive influence on the shortage of skilled labour in Ireland. However, we should proceed with caution in particularly to the housing sector. As our skilled workers increase, so too will the demand for housing resulting in higher house prices. Voting for the 2019 Best Construction Blog closes on March 31. You can cast one ballot for each email address, but can vote for as many blogs as you wish.